Our youth climbing program is designed to help the child develop their climbing skills in a fun and safe learning environment. More than climbing technique, we address the mental and physical strengthening needed for a lifetime of climbing! Our instructors are trained and certified by the American Mountain Guides Association (AMGA). The AMGA is the only internationally recognized mountain guiding organization in the United States, and their instructors go through rigorous training and testing to ensure the highest level of competence and professionalism. Guides vs. Instructors: Often a source of confusion in the outdoor industry, guides are excellent for taking a client through challenging terrain. However, if learning is the objective, then an instructor is the right choice. 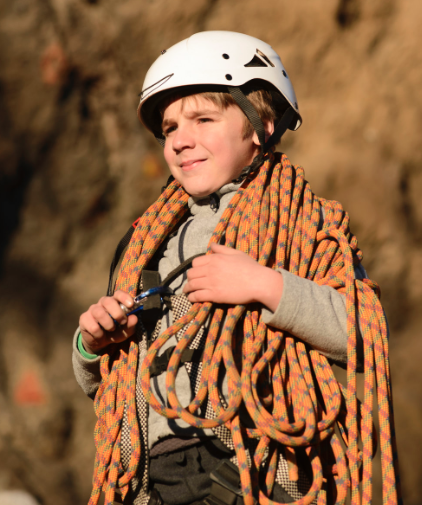 Our youth programs are led by instructors, trained by the AMGA to teach the skills your child will need for a safe and successful pursuit of climbing! Your child will receive the highest level of instruction available, by a professional who is passionate about teaching and climbing. Your child will learn efficient climbing movement and technique. In addition to learning how to move across the surface of the rock, they will learn how to strengthen the body and the mind for the many challenges we encounter while climbing. Each class is limited to six student athletes. This allows an excellent instructor to student ratio and a small group of athletes to train and grow together. Friendships established in these environments can last a lifetime.